FREE GIFT: PC MOZAKI BLOCKS DELUXE TETRIS TYPE GAME! Working FRANKLIN RF-8131 PALM STYLE TOUCH SCREEN PDA in "Very Good" condition. Brand New batteries installed! Great PDA apps with Desktop PDA software on CD, and a serial connector cable. 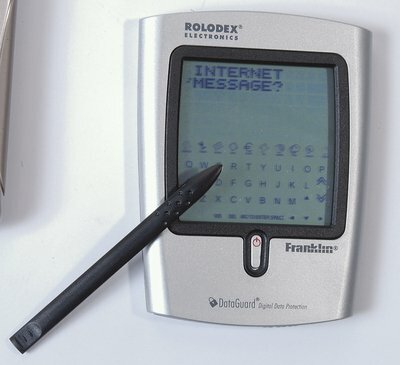 Sync information to your PC an to the Franklin PDA! Items include Franklin PDA, serial sync cable, CD software, stylus, screen protector cover, and FREE game. Ships Fast, Enjoy!! If you have any questions about this product by Franklin Electronics, contact us by completing and submitting the form below. If you are looking for a specif part number, please include it with your message.